Prize: Custom-branded Xbox One X console (console model, features, design, and all other aspects of the console are at the sole discretion of the Sponsor); and one Samsung television ($1,048). What you must do to enter: 1.) Follow @Xbox or @XboxCanada 2.) 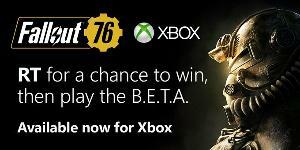 Retweet one of the Sponsor’s designated promotional Tweets containing #Fallout76Sweepstakes. Statistics: This contest was opened by 118 and entered by 10 ContestChest.com members. 8% of those who opened the contest, entered it.